Yeah, a Mars protein powder! Obviously another sign of how important is the ‘protein’ category becoming for traditional food brands. 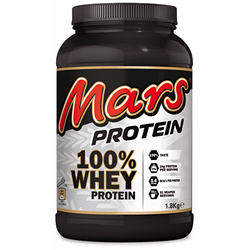 Mars protein powder is a new product from the Mars line and quite an intriguing one at that. If you’ve tried their protein bars then you’ll know that Mars are pretty good at creating great tasting products that can still be high in protein. It’s all very well talking about the superior taste of a protein powder, but at the end of the day, it’s all about the quality of the label. Each serving contains 24g of protein and 5.4g of Branched-Chain Amino Acids. There is only 4g of carbohydrates, which is a lot less than you would have assumed, and there is only 2.6g of fat! These are some very good macros, and it’s fair to say that from a nutrition point of view, Mars’ protein shake is as good as almost any supplement we’ve reviewed. The shake is made up of a protein blend of whey protein concentrate, whey protein isolate, and flavor whey protein. There is a fat-reduced cocoa powder used for flavour and a sucralose sweetener. Which is how the shake can taste nice while staying low in carbs and fat. Bottom Line: Mars’ protein powder has a really good macronutrient content with a lot of protein, low fat and low carbs. The mix of concentrate, isolate, and hydrolysed protein is fairly standard. Overall a decent shake. Taste & Mixability: The shake mixes very well, making for a nice frothy shake that feels more like a milkshake. Taste-wise it’s a bit mixed when consumed with water the shake is quite weak tasting and you can barely notice the chocolate (though the caramel comes across quite strong). But mix it with milk and you have a really nice tasting protein shake. When mixed with milk Mars whey protein powder is probably one of the nicest protein powders on the market, it could easily fit into our top ten best tasting protein powders list . Effectiveness: It’s high protein and low calorie, so how much more effective could you ask for? We all know the many benefits of a high protein diet – particularly when training, and this is as good as any. At the moment you can purchase 23 servings of protein powder for £34 ($44) putting it at the ‘very expensive’ category. Remember to check our price comparison and deals for any offers on this product. Great tasting (when mixed with milk) with a high protein content and low calories, the Mars Protein powder is really good but a little bit expensive. If you can find it on a deal then definitely get yourself a tub or two. NOT SURE WHICH PROTEIN POWDER IS RIGHT FOR YOU, CHECK OUT OUR BEST 10 PROTEIN POWDERS FOR 2017. SEE THE HOTTEST PROTEIN POWDERS DEALS FROM AROUND THE WEB!